 Directions: North of Maple Park, IL. On County Line Rd. 1 mile to Pleasant St. Rd., then West to sale site. 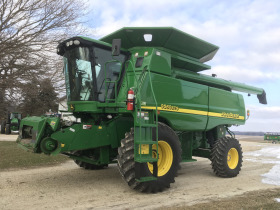 Watch for Auction Signs. 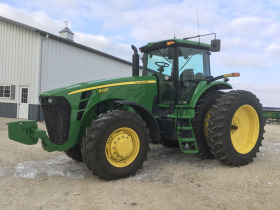 2009 JD 8330, MFWD, 1560 hrs., PS trans, 3hyd., 1000 pto, Auto Trac ready, quick hitch, 480/80R46 w/duals, 420/90R30 front tires, S/N RW8330P046657; 2004 JD 8320, MFWD, 2858 hrs., PS trans, 3hyd., 1000 pto, quick hitch, 480/80R46 w/duals, 420/90R30 front tires, S/N RW8320P020527; 1959 JD 730, diesel, PS, NF, electric start, 1hyd., pto, S/N 7318718; Ford 335, diesel Loader Tractor, 1hyd., 3pt., pto; 1950 IH M, 1hyd., pto, S/N 23949X1; 2006 JD 9560 STS Combine, sep. 1725, eng. 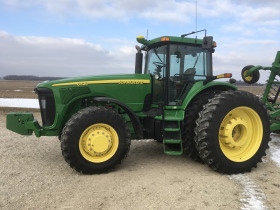 2414, 2WD, Contour Master, Maurer Bin Ext., chopper, long auger, 30.5-32, Auto Trac ready, S/N H09560S715890; 2006 JD 693 Poly Corn Head, 6r-30”, hyd. 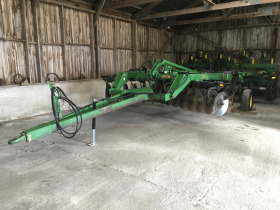 deck plates, knife rolls ,S/N H00693X615496, 2006 JD 630F Hydraflex Grain Head, 30’, S/N H00630F615765; Unverferth HT 30 Head Trailer w/lights; 2013 JD 2630 display, Auto Trac section control; JD 2600 display, Auto Trac; 2010 JD Starfire 3000 – SF1, SF2 ready; 2008 JD Starfire ITC-SF1; Auto Trac Universal steering kit 200. 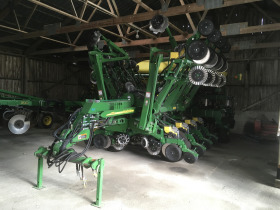 2014 JD 1790 Planter, 12/24, CCS Seed Delivery, twin hoppers, hyd. 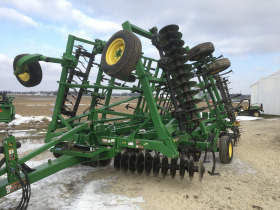 drive, vacuum, active pneumatic down pressure, trash wheels, row command clutches, 3085 acres, One Owner; 2009 JD 2310, 27’9” Soil Finisher, gauge wheels, 6 bar spike tooth drag, One Owner; JD 510 Disc Chisel, 5 shank; Case-IH 496 Disk, 24’, 7.5 spacing, Harlan rear hitch; Brent 774 Grain Cart w/roll tarp; 2014 Unverferth 2750 Seed Runner, seed tender, tandem axle, 2 compartment, Honda 6X340 eng., long conveyor, roll tarp, Talc applicator, 3 function remote w/scale; DMI 3200, 11 knife NH3 Applicator, w/Hiniker Monitor; Woods BW 1260 single wing Bat Wing Mower, 540 pto, 10’; JD 845 12 row Cultivator, flat fold, gauge wheels, rolling shields; Killbros 375 Gravity Wagon, w/JD 1075 gear; (2) Hutchinson 8” x 62’ pto Augers, w/hyd. 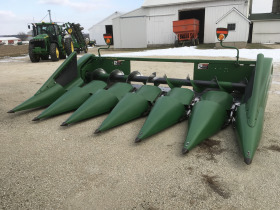 lift; Hutchinson 10” x 30’ Auger w/electric motor; Woods Cadet MD 172 Mower, 6’; Long 12’ Stalk Chopper; JD 1350-1450 5 bottom Plow; JD 6’ Sickle Mower; 24’ Drag Cart; 2 wheel Sprayer, 400 gal. 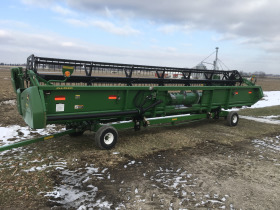 w/booms; 14’ Hayrack w/JD gear; Wood Flare Box Wagon; Metal Flare Box; 1500 gal poly tank; inductor tank; 18.4-38 clamp on duals; 15.5-38 clamp on duals; Karcher HDS 3.0/20 CEA Steam Cleaner; 100 gal truck fuel tank w/12 volt pump; 20hp, 3 phase 220 motor; Old Wayne Gas Pump Cut 60, S/N 47432; (2) Fairmont Mudge Railroad Speeder Gas Engines (1 w/engine frame/carrier); (3) Auger Hoppers; Simplicity Snowbuster 724 snow blower; Acetylene Torch, Tanks & Cart; Marquette 180 amp Welder; 32”x46” welding table w/vise; Craftsman 3hp 20gal. 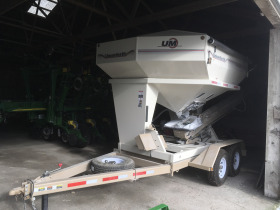 compressor; Hein Werner 12 ton press; anvil; Snap On Tool Box on wheels; wood bolt bin w/bolts; (2) lever oil drum pumps; (3) old oil pumps w/tanks; (4) 11L-15 tires & rims; (2) JD suit case weights, 30 series tractors; Lincoln 12 volt grease gun; Snap On 14.4 volt 3/8” impact wrench; Dewalt drywall drill; Makita table saw; 6 drawer storage cabinet; (2) grain moisture testers (1 portable); auger dolly; JD Lawnmower: blade, weights & chains; 55 gal drum cradle/truck; 2200 watt Generator; LP portable heater; cattle oiler; horse harness; long wood eaves trough; misc. tools, wrenches, impact sockets. 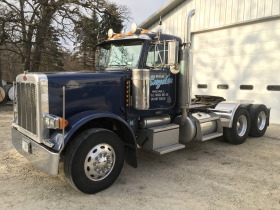 2001 Peterbilt 379 Semi-Truck, C15 engine, S/N 6NZ32201, 475hp, 13 sp., air ride, wet kit, split fuel tank, 808,980 miles, One Owner; 1995 Chevy Silverado Pickup Z71 Truck, 4x4, regular cab, long box, 134,231 miles, w/Western snow plow, 7.5’.